This technique, which involves the potter incising a design into the clay body filling it in with contrasting colored clay or slip then covering it with a transparent glaze. A Japanese technique, it is named for the city of Mishima in Shiuoka Prefecture (district) that dates back to the Koryo Period (935-1392). 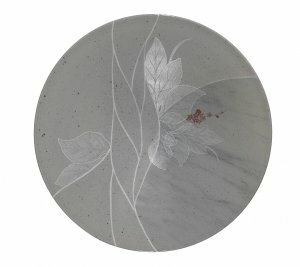 While experimenting with different combinations, inlaying porcelain into stoneware is the one I use most often. The strong white lines in contrast to the warm gray produces an effect which suites my carving and allows me to further embellish the pieces with hints of color.